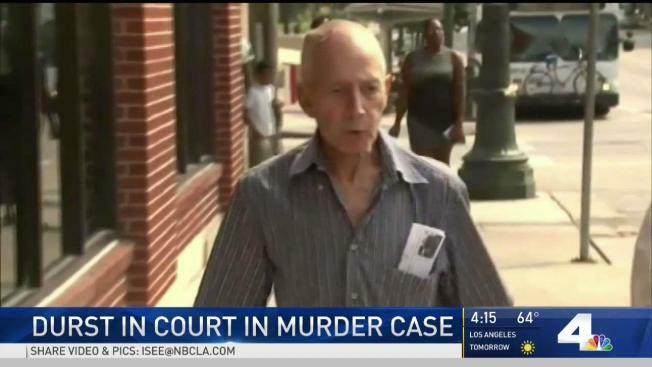 A black-and-white photo displayed on a courtroom wall Monday provided a stark reminder of how much had changed in Robert Durst's life over nearly four decades. The photo dating to at least the early 1980s showed the New York real estate heir's best friend, Susan Berman, beaming, flanked by a bearded Durst wearing a smirk and his wife, Kathleen, with an electric smile. Prosecutors say Durst killed his college friend, the daughter of a Las Vegas mobster, because he believed she was going to tell police what she knew about Kathleen Durst's death. Robert Durst, 75, an eccentric multimillionaire, has never been charged with a crime related to his wife's 1982 disappearance in New York. He has pleaded not guilty to Berman's 2000 death at her Los Angeles house. The first day of the hearing revealed little that was not previously disclosed in an HBO documentary series, court filings and other proceedings, but it made the connection between Berman's death and the mystery around Kathleen Durst's disappearance, which prosecutors want to show as the foundation for the motive for Berman's slaying. Karen Minutello, manager of the Manhattan building where the Dursts lived in a penthouse apartment, said Kathleen Durst called her about a week before her disappearance and asked to rent her own unit because she didn't want to live with her husband anymore. "She was hesitant, she didn't just blurt out why. Then she did say she needed to get away from him," Minutello said. "She was afraid of him." Days after Kathleen Durst vanished, Minutello said she was alerted to a broken trash compactor that she found jammed with the missing woman's possessions, including notebooks with her name, dresses, makeup and a hair dryer. She made notes about the finding because it seemed significant. "Who does that?" Minutello said. "Whose loved one is missing and they throw out their stuff?" After the disappearance, Berman served as Robert Durst's unofficial spokeswoman. But prosecutors and witnesses in a series of earlier hearings said she did much more. Judge Mark Windham threw both sides a curve when he said he was inclined to allow the testimony because he didn't think it was hearsay. He said they could be characterized as statements Susan Berman would have made as a witness if she had been alive. It was an image from Berman's autopsy. Her right eye was blackened, and her tongue was between her lips.